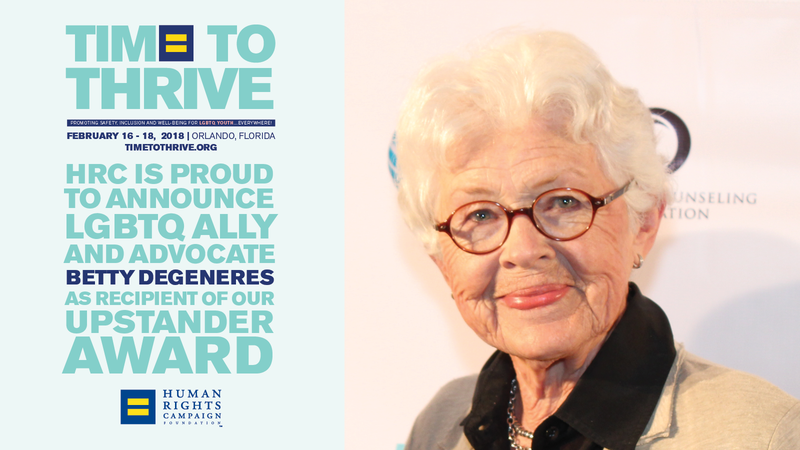 HRC Foundation announced that it will honor longtime ally and LGBTQ advocate Betty DeGeneres with an Upstander Award at the organization’s fifth annual Time to THRIVE Conference on February 16-18 at the Hilton Orlando Bonnet Creek in Orlando. The announcement comes on the day her daughter, Ellen DeGeneres, who came out publicly two decades ago on her groundbreaking sitcom "Ellen," celebrates her 60th birthday. 2. She was the first non-LGBTQ ally to join HRC’s National Coming Out Project. “As long as our gay sons and daughters face discrimination and are excluded from the basic protections of our laws, I will urge all American families to come out for fairness,” Betty told HRC’s Equality Magazine in 1997. 3. Betty has published not one, not two -- but THREE books on being an incredible parent to LGBTQ children. 4. She unwaveringly supports her daughter, appearing on "The Ellen Show" countless times to spread love, positivity, acceptance -- and more than a few laughs! HRC previously announced that it will also honor transgender advocate Gavin Grimm with an Upstander Award during the Time to THRIVE Conference. Grimm made history after suing his school district over its discriminatory policy that barred him from using the boy’s restroom, alleging that the district violated Title IX of the Education Amendments of 1972. DeGeneres will also join fellow parent-advocates Judy and Dennis Shepard of the Matthew Shepard Foundation. HRC National Press Secretary Sarah McBride, along with HRC’s Parents for Transgender Equality Council, Youth Ambassadors and Welcoming Schools Program will also be featured at the conference. The event brings together a wide range of youth-serving professionals to discuss best practices for working with and caring for LGBTQ youth and their families in schools, community centers, health care settings and beyond. It is co-presented by the National Education Association and the American Counseling Association. Toyota, BBVA Compass and AT&T are presenting sponsors of the event.